Lately, I have been listening to a 2006 Caedmon's Call album called "In the Company of Angels II: The World Will Sing." I LOVE me some Caedmon's, mostly due to their thick harmonies and their lyrical richness. In this day of crank-it-out-quick pop hits, Caedmon's has always hearkened to an older age of more thoughtful writing. Their music is rife with quality vocabulary and imagery...and the biblical and historical allusions abound! The "In the Company of Angels" albums were compiled in order to breathe fresh air into old hymns and create new songs that still had that older, hymn-like structure. One of the songs I've had on repeat (and there have been SEVERAL) in my car lately is "Fellowship So Deep." Listening to this song over and over has cultivated within me a desire to have that "fellowship so deep" with Christ even more with each passing day. 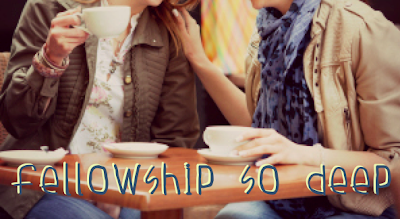 It has also prompted me to seek out opportunities to have "fellowship so deep" with my sisters in Christ. I was incredibly blessed to be able to sit and share coffee with a friend and her precious baby boy the other day. It was a wonderful time of catching up and planning for a future event we're attending. But more special than the details of our chat was time spent with a like-minded soul...another believer who is actively growing in Christ and challenging herself to step outside of comfortability and disciple others. She asked advice of me and I did of her as well. There was a free-flow exchange of experience and calling in our conversation. It was a Proverbs 27:17 kind of discussion - "Iron sharpens iron, and one man (or woman!) sharpens another." In a way, it filled me up. But it also made me long for even more. I remember a time a few years back when I had several really good girlfriends who studied with me and held me accountable on a daily/weekly basis. Several relocations and a marriage later, I do enjoy the daily fellowship of my husband. And he is a wonderful encourager in such things. But there's just something special about the friendship of other sisters. It's a different type of "fellowship so deep." So I am committing afresh to intentionality in my friendships. I want to invest in others and have them challenge me as well. I want to reconnect with some and newly engage with others. Lord, let me sing of my Redeemer and of His love that made me free. And know this gift is mine forever - fellowship so deep. Let me show that gift to others, to believers and unbelievers alike. And let Your love truly be the language that I speak. Embolden me not to wait around for people to "drop into my lap" but rather to reach out in intentionality and grasp those opportunities for true fellowship.